The theory of evolution states that random variations in organisms occur to better suit their surroundings. We take for example a bacteria's flagella. There's a bacteria who has a tube kind of structure that it uses to inject toxins in other cells. Structure of flagella and this tubular structure is very similar. So biologists state that this is clear evidence for evolutionary process wherein this tubular structure underwent gradual changes that resulted into a flagella. Now my question is, minute changes did occur to this tubular structure, but how do those changes get carried over to the next generation? Almost all components of a cell are created as per the instructions coded into DNA. So does it mean that every minute changes that occur to an organism get recorded into DNA so that they can be carried over? In above example, assume, that a few proteins got accidentally attached to the tubular structure that will help the structure to rotate. Now when this temporarily changed bacteria gets divided into a new one it will have lost that change. So to actually carry over this "beneficial" change would the bacteria have changed its genome? How does this happen? What is the basal mechanism that supports evolutionary changes? The second stage of evolution is natural selection. After the mutagenesis event, nature rigorously selects for the mutation. If the mutation has a fitness cost to the organism, it gets removed (the organism doesn't survive). By removing all things that are more costly than beneficial, nature selects for the fittest. Very rarely does the external environment directly change the DNA code (you can argue about epigenetics, but that's a different can of worms). 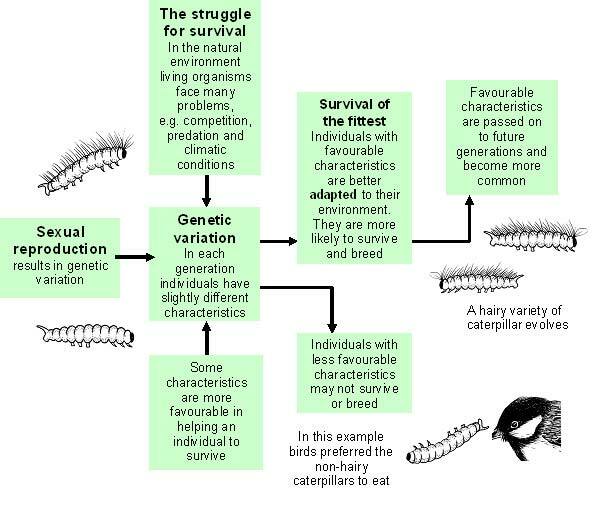 Changes in the environment usually dictate the survival of organisms with different traits. In fact what usually happens is a change in the DNA code occurs naturally due to mutagenesis and that change undergoes the rigours of natural selection. So in you case what might have happened is (I am postulating here, I would recommend a literature search to verify this), your bacteria had a tubular structure that it used to inject toxins in other cells. Some bacteria (due to genetic variation in sexual reproduction) had mutations that allowed it to move this tubular structure. This allowed it to survive more efficiently, and hence reproduce more. Eventually this population of bacteria, slowly replaced the bacteria who had no locomotor control on their "tube", and hence one stage of natural selection has occurred. Now this happens again and again, till the efficiency of the locomotion is optimal. Might I suggest you read this book ? Not the answer you're looking for? Browse other questions tagged evolution bacteriology molecular-evolution or ask your own question. Why would a single celled organism evolve to be multi-celled? What are the requirements for a stable carbon cycle in sealed “bottle gardens”`?